Staying Fashionable Without Going Broke! With the recession in full swing and the holidays coming up, saving money is probably one of the first things on our mind. But saving money doesn’t mean you have to compromise on your look and style. In fact, there are tons of ways to keep your great style all while looking chic and stylish. These tips are only a few money-savers that will help you through these hard times. Don’t buy anything piece of clothing that’s so unique, you’ll only want to wear it once. Instead, buy classic and solid colors. You can mix and match almost anything without a pattern and tie it together with some unique accessories. Accessorizing is key to making your outfit different from the day before. Plus, it’s much cheaper to get a new necklace then an entire outfit. Re-Make Your Clothing. Sites like Threadbanger.com offer endless tips and ideas to refashion something you already have into something new. If you don’t have any clothes worthy of cutting up, hit up your local GoodWill or Salvation Army. Shop the expensive stores, buy from the cheap. Usually a lot of the cheaper clothing stores like Forever21 have very similar if not, identical versions of expensive designer clothing. If there’s a MUST HAVE item, shop the more affordable stores first. Splurge when we’re out of the recession. Shop Online and Use Promotional Discount Codes. Online shopping makes it so easy to spend a lot.. and save a ton too! Look for discount codes by typing in the store name + promo code or discount code into Google. You can easily find coupons for most stores for a percentage off, free shipping or sometimes a free gift. Totally worth search. Make Homemade Gifts. Hit up your local craft stores or bake your friends and family members a tasty original treat that they can share. It’s the thought that counts, not the price-tag and the holidays are about sharing, right? Trade With Friends. Need a new cocktail dress for your work holiday party? Raid your friends’ closets and have them do the same. It’s totally free and you’ll both get something new to wear out of it. I even recommend trading items of clothing that you’ve just outworn and are tired of. in 6 months, that old piece of clothing will seem new again and you can trade back! If I missed any tips that you’ve been practicing during this recession, let me know in the comments!! I’m not a big sewer. In fact, I usually get mad when I use a sewing machine and my projects end up half finished because I don’t have that much patience. However, this time I was determined to make something that I’d actually use. 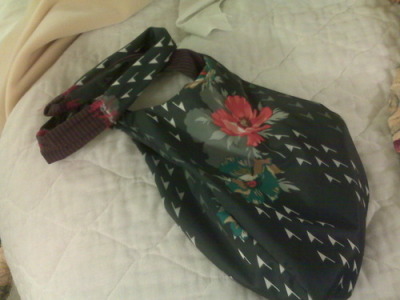 I got this fabric from GoodWill and made this lined tote bag. Not bad for my first bag, huh? The straps are all different materials since I kept making it longer and added a chaos stitching to make it look punk-ish. 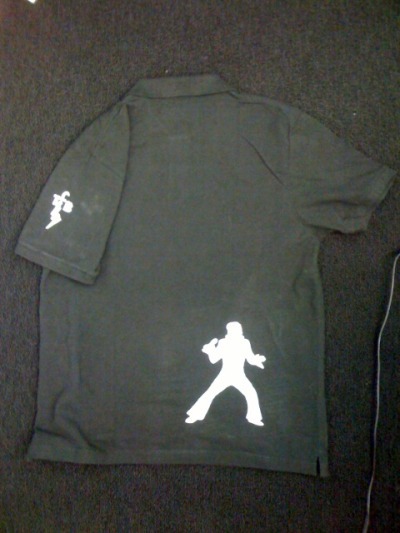 Also, the lining is purple pin stripes with pockets. I am so proud of myself! What do you think? Grafitti Lace and Totally Bamboo Giveaway! Hey guys! Check out this video! There’s a 10% off promo code for Totally Bamboo’s eco friendly products! If you’ve always wanted one of those bolero/shrug wraps but ever found the right one, now you can make one! This is a great tutorial with easy steps to make one from an old turtleneck! And also, if you don’t have a sewing machine, get out your video cameras, because now is your chance to win one! I made these shirts yesterday for my boyfriend. He has to wear collard black shirts to work and quite frankly, he was running out of them. I went to Old Navy and bought 2 plain polo shirts for $12 each. I printed out pictures on from the internet and cut out the negative spaces using a pen razor. For the elvis shirt, I painted the image. I left the color uneven to add more texture. 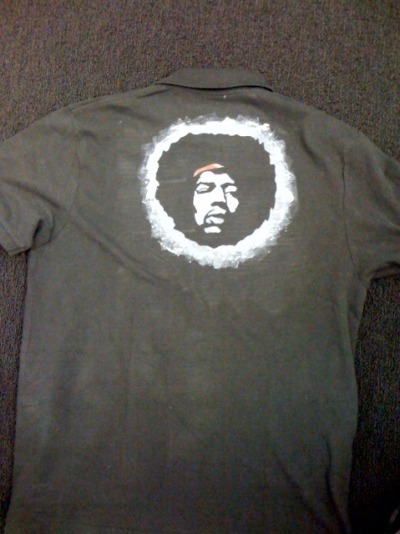 For the Jimi Hendrix shirt, I sponged the stencil. This worked out well because I used a mix of white, gray and black for the shading on the face. Then I painted the headband red so it would stand out. Check out this video where Rob and Corinne from Threadbanger show you how to make your own eco-friendly cosmetics. It’s really easy and really fun – plus you can add your own fragrances and essential oils! If you still need something special for Valentine’s Day, check out this video, where Rob and Corinne of Threadbanger show us how to make a sweet pair of boxers out of 2 pillowcases, and a rad corset with some old clothing. This Holiday season, Threadbanger is bringing us a NEW show!!! Yup – because we just couldn’t get enough of the weekly Friday show, we now have a holiday How-To! happy halloween! costumes for slackers! So we all know that Halloween is right around the corner and some of us (including myself) don’t have halloween costumes yet! Well don’t fret, here are some quick and dirty ways to make some fabulous costumes from scratch! A mummy, a fairy, pirate, witch!? Check out Threadbanger.com for more tips on Halloween costumes! She makes it look so easy!!! Any ideas on where I can find a good beading store in NYC so I can make some of my own jewelry? Of all the jewellery items, bracelets and things with diamonds make the best gifts for women and cuff links make the best gifts for men.